Currently the United States is the only country in the OECD that does not have a Value Added Tax. Some in the American left believe that the US should introduce a federal Value Added Tax. The pro-market side argues that a VAT leads to an expansion of government. Much of the growth of the welfare state in Europe was financed with the VAT. Between 1970-2007 the VAT increased from 2.8% of GDP to 7.5% of GDP in western Europe (EU15). The VAT is currently 19% of tax revenue in the EU15. 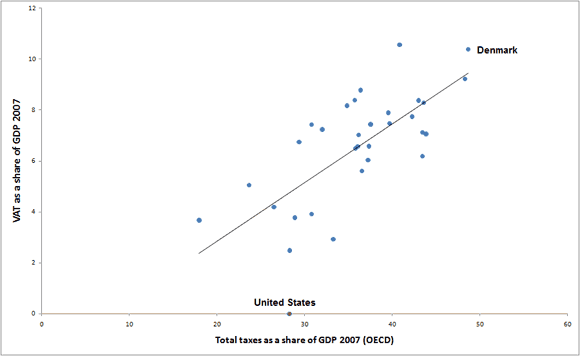 Not surprisingly, there is a very strong correlation between the total tax burden and the size of the VAT. Of course we cannot know what would have happened if Europe had not introduces a VAT, maybe they would have expanded government in a different way. Still there is a strong association between the growth in the VAT and the growth in the size of government. 41% of the increase in tax revenue for the EU15 between 1970-2007 was due to the increase in the VAT. 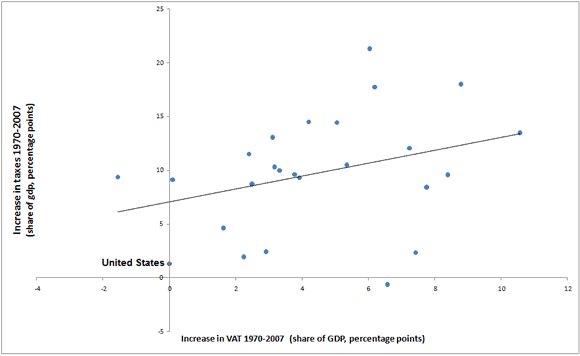 This graph plots the increase in VAT with the increase in total taxes, countries where the VAT revenue expanded the most tended to be those that had faster growth in the size of the state. 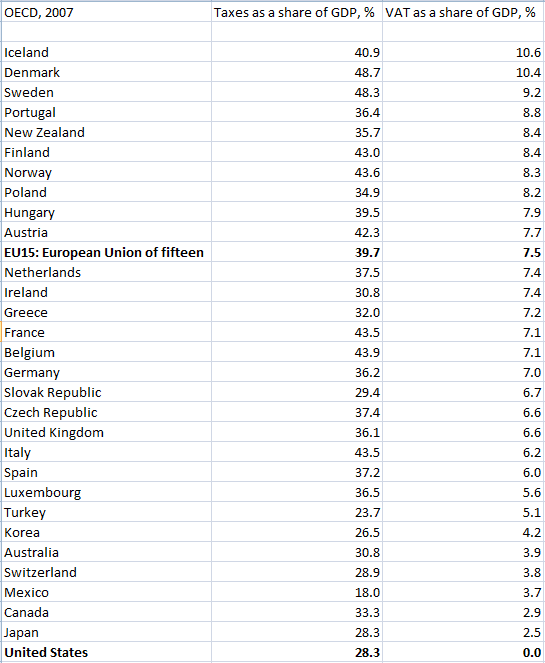 Finally here is the list of OECD countries by total tax revenue and VAT tax revenue. From an revenue efficiency perspective, the VAT is considered an efficient tax, because it does not tax savings and because tax evasion is low. However it is a misunderstanding that consumption taxes do not tax work. The reason people work is to earn income and consume. If the price of consumption goes up due to taxes but the price of leisure is constant, this is a tax on work and a distortion in the choice between work and leisure. Still from a narrow distortion point of view it is as good or better than the income tax. But efficiency should be interpreted more broadly than pure revenue effects. Democratic efficiency matters as well, and here the VAT does poorly. The biggest problem with the VAT is that it is hidden taxation. The income tax is easy to understand (the government takes, say, 20% of your income). Consumption taxes in contrast are “baked in” the price of goods and easily forgotten or ignored. Anyone who opposes further expansion of the U.S government should fight hard against the VAT. Tino Sanandaji is a 29 year old PhD student in Public Policy at the University of Chicago, and the Chief Economist of the free-market think tank Captus. Gone would be the incentive for multi-nationals to park profits overseas in lower-tax rated countries. What IF…healthcare premiums were paid with a VAT and vouchers issued for placement in an insurance exchange? Gone would be a major price advantage for imports. Hidden Tax? A bogus complaint. A value-added-tax is less hidden than the corporate income tax. Who doesn’t understand what, for example, a 10% VAT means to a product costing $100.00? On the contrary, the corporate income tax is buried within the selling price of goods. Take Exxon, for example…what percent of your gasoline price per gallon represents the corporate tax? What percent of your bill at the local restaurant represents their corporate profit? What about your dry cleaning? Your shoes?